There is so much to say and so much being said about what is happening in Israel, Gaza and the West Bank. 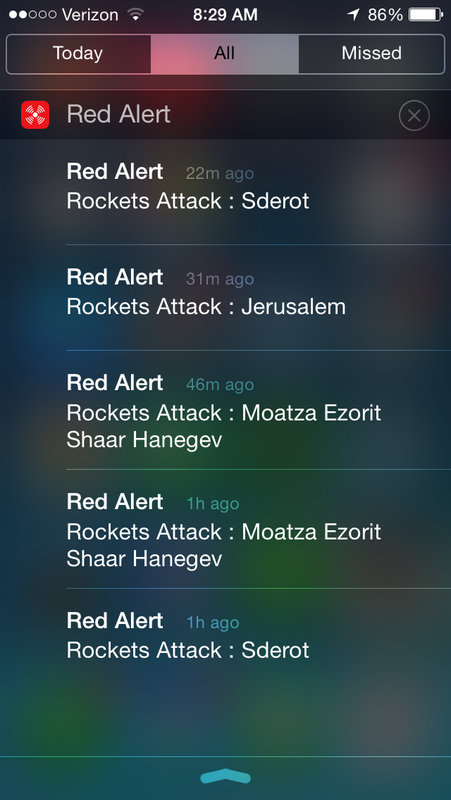 Two days ago I downloaded an app called “Red Alert” that lets you know (you can set the settings) when a missile or rocket is headed and if you are in that area to take cover in Israel. There are, of course, also loud sirens in the streets indicating citizens of Israel should move towards the bomb shelters. This is a snapshot of my notifications from this morning. I must be honest I am feeling a lot of feelings. The situation is completely horrible. My loved ones, my friends, my colleagues, my Israeli and Arab brothers and sisters are under attack by a terrorist regime that is using civilians as human shields to perpetrate fear, violence and destruction. The first night I downloaded the app as I attempted to sleep about every 45 minutes or so the app would sound that another rocket or missile was headed towards a population center. It was a restless night of sleep, and at one point, somewhere around 3am, my semi-conscious self realized that I could turn off the alerts. I could make it go away in order to sleep. My Israeli brothers and sisters don’t have this luxury of turning off the alarm. Now know what it is like to be on the other side of the phone call. During my first year of studies at HUC-JIR (2003-2004) there were many times I grabbed my cell phone and made the expensive call to my parents and said, “Hi Mom/Dad. I’m fine. I’m calling to let you know there was a bombing…” Tuesday I received the call. “Hi E. I’m fine. I’m in the bomb shelter at the hotel.” And this morning the message came by text. “I’m ok. 4 rockets in Jlem. Iron dome hooray!” Hooray for Iron Dome, indeed. Israel might seem so far away but my brothers and sisters are living a very different reality. And because I don’t know what else to do I pray for the peace of Jerusalem [and all of Israel]. I hope you might join me. And “Red Alert” went off again. This time Be’er Sheva. This entry was posted in family, Israel, Peace and tagged family, Israel, protective edge. Bookmark the permalink.